To make the laksa paste, chop the garlic, ginger, eschalots, chillies, lemongrass and coriander roots. Finely grate the turmeric. Place in a small food processor. Add the fish sauce, palm sugar, ground coriander and cumin and process until the mixture forms a paste. Heat the oil in a wok over medium heat. Add the laksa paste and cook, stirring, for 6–8 minutes or until fragrant. Add the coconut milk, stock and water and bring to the boil. Add the fish sauce, lime leaves and chicken and cook for 8 minutes or until the chicken is cooked through. Carefully remove the chicken and shred using 2 forks. 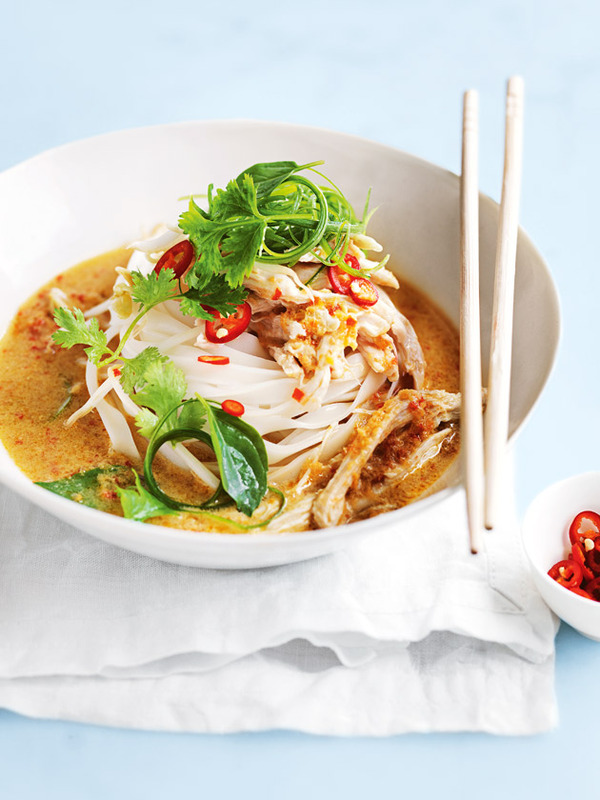 Divide the noodles between bowls and top with the laksa and shredded chicken. Top with the coriander, basil, onion and chilli to serve. Serves 4–6.